There's a new Galaxy Note 8 leak on the block, and this one's pretty saucy. 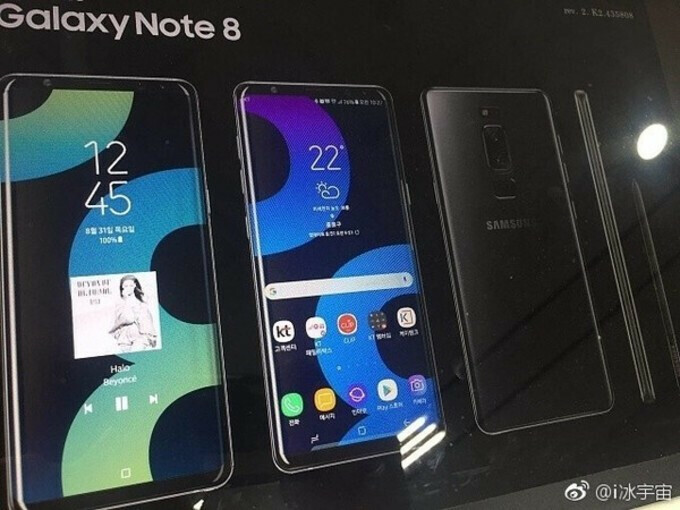 A purported promotional poster of Samsung's upcoming handset has been unearthed, giving us a sneak peek at the possible final design of the Note 8. There are dual cameras at the back, which falls in line with what has been expected for this year's phablet, as well as a rear-positioned fingerprint scanner at the rear, which coincides with the latest news on the matter. Apparently, Samsung has been unable to come with a workaround for a brightness issue that was allegedly caused by its in-display fingerprint scanner, which ultimately led to the inclusion of a traditional scanner at the rear of the Note 8. Mind you, the positioning of this one is just below the camera and not to the side, which would likely make it easier to locate and interact with. As a reminder, not everyone was thrilled with Galaxy S8, S8+'s placement of this vital biometric sensor which is said to have caused issues for some users. Weirdly, the flash unit with the heartrate sensor (a staple for Samsung's high-end phones for a while) has been placed higher, close to the top end of the phone. Provided that Samsung is not dropping these biometric sensors anytime soon, their placement seems to be a bit awkward as it will likely cause users to stretch out their fingers all the way to the top in order to reach the sensors. Given that this promo poster is real, it will confirm that the Note 8 will reiterate Galaxy S8's design language - very high screen-to-body ratio, small bezels at the top and bottom, and slightly curved edge display. We expect the Galaxy Note 8 to become official sometime in late August or even early September in the worst case scenario. Supposedly, it might cost around €999 in Europe and ~$900 in the US. You can read more about the phone in our dedicated rumor review by visiting the link below. Aug 16, 2017, 9:09 AM, by Kaloyan C.
Make the green one Sammy. I am sick of Gold, Purple, etc. Black is classic, but it's old for phones. Exactly, i want the green emerald. If you want my $, you need a removable battery and full aluminum build. A phone that doesn't have the ability to hot swap a full battery, and that shatters when dropped a few inches, is worthless to me. I won't go so far as "worthless". But, I 100% agree about the swappable battery and decent durability. How the mainstream has lost the value of easy battery swaps and have accepted glass backs is beyond understanding to me. I'm still planning on the Note 8 even tho. Lol, the s8 looks better tbh and this phone for all intent just looks too big. Btw, whats up with the back being so busy (fps, heartrate monitor, flash, dual camera). That being said, this is not the note 8 u will see in sept, as that will have an iphone-esque horizontal camera by the side (ouch) and not a vertical one (as seeing in this image). I'm saving this post to re-quote in Sept to reiterate to everyone what a gigantic troll you are. The Samsung Galaxy S8 is too skinny in my opinion. Gorgeous looking phone but I'll probably hold on to my Note 5 until the fingerprint scanner is under the screen. I'm not a fan of the fingerprint scanner on the back in general. True that. Fingerprint scanners belong on the front of the device. Hope Samsung gets the tech ready for next year. So beautiful, except for the rear looking way too busy. The fingerprint scanner just ruins what could have been a nice, clean, minimal backside. Busy = beauty, empty = extremely ugly. Eh, dude, beauty is simplicity. Beauty is subjective. For instance, the iPhone since the 6 has been hideous. You probably disagree. Tbh to samsung, the tech wasnt ready for them yet. Its just that the rear, rectangular fps and positioning is a whole new level of uglyness. Ugly. Especially the back side. Being that nearly ALL leaks this year have been proven legit replicas and/or final renders, I have absolutely no reason to doubt that these aren't gonna be final production models. this looks a bit better, the placement of the scanner is better than the current setup. It's much the same as other back placements. So I think it's safe to say there's not going to be an embedded FPS from any phone this year which I'm okay with. Unless they're going to add a coating to the screen to prevent prints and smudges, next year they should just go the Sony route and have the FPS built into the power button. So where do you get this idea that any phone won't have it. You know d*** well there is a strong possibility that the iPhone 8 will have it under the screen dude. They use their own in house company to work on this, not Samsungs company. Don't be fooled by Samsung. They are good with screen tech and software gimmicks, but outside of that, they struggle. This is where Apple shines! Lol sure they do sheep. Samsung is far ahead of Apple on the technology curve. Technowhat? Lmao. Is that why apple is the most valuable tech company in the world? But but but samsung create and apple just buys. Well, samsung buys these engineers as well (or u think their parents get married and have children that grow up in the samsung factories, lmao) and apple buys the best companies with the best engineers. See that? Big difference there, between the predator (apple) and the prey (samsung)..
Lol Apple is the most valuable tech company thanks to sheep like you and nctx. Not something anyone should be proud of. Samsung does buy companies when they want in on a market they never considered like when they bought level and that hk something sound company but they generally have to develop their own talent in the wireless, display , and microchip sectors because they simply do not have that much sheep money to "bankz" They have to draft rather than just buy free agents with sheep money. They are too technologically advanced in too many fields to be able to afford to buy everyone. Apple deals with mainly mobile phones. Samsung everything under the sun. Build for $2, and sell for $200, and you may have a shot at being the MVC. Valuable doesn't mean best fool. I got the idea from reading MULTIPLE articles saying Samsung and Apple are having trouble finalizing the tech for a FPS embedded into the screen. Exactly how does Apple shine in this area when it hasn't been done before? I can guarantee you you that those "gimmicks" make using my phone a lot easier. I never resort to calling people iDiots, but I'm making an exception for you just because how defensive you got and turned this into a Samsung vs Apple thing even though I never mentioned any particular company. I said they, as in any company thinking about adding this feature in the future. Looks ugly. And the gimmick curve screen is back. Really Samsung?